For many people, this is the most important group game of the 2016 Olympics. After three games, both of these teams will be looking for a win to consolidate their push to the knockout round but this game is about more than where you finish in a table. There is a high level of pride when Brazil and Argentina clash and the home crowd in Rio will be cheering their team on with every ounce of breath that they have. If you’re looking for a game where the atmosphere is electric, this is likely to be the 2016 Olympic Games basketball match you need to watch. Argentina lost out in their last game, losing to Lithuania. This is no real surprise, the Lithuanians have been considered as one of the best of the rest this tournament and they have achieved some positive results already in Rio. Manu Ginóbili, of the San Antonio Spurs, provided 22 points in the defeat. Brazil are currently in fourth place, looking to cling on to the last qualifying spot and they lost narrowly in their last outing against Croatia. Again, Croatia are a team that are highly regarded for this tournament but it was a disappointing result for the hosts. Leandro Barbosa of the Phoenix Suns provided 16 points in the defeat. The Argentineans are the slight favourites for this game and you can back Argentina at -2.5 at odds of 1.90. If you are looking for the Over/Under market, you should look to go UNDER 160.0 which is available at odds of 1.90. Bet Now! In the Race to 20 Points, you’ll find that Argentina can be backed at 1.71. 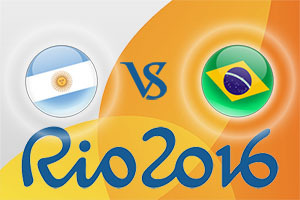 There could be an argument for Argentina starting strongly and then the home crowd roaring Brazil on to success. If you like the idea of an Argentina half-time, Brazil full-time bet, you’ll find the odds available at 7.00. With so much passion at stake, this match is unmissable. The game starts at 1815 BST on Saturday 13th of August.